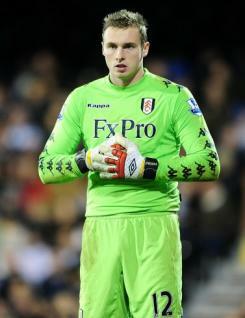 David Stockdale is a young goalkeeper who joined Fulham from Darlington in the summer of 2008. The consistency of regular ?keeper Mark Schwarzer meant that he rarely got a look in during his first two seasons at Craven Cottage, although when given his Premier League debut in September 2009 he performed superbly as the Cottagers rallied from going a goal down to beat Everton 2-1. He spent the second half of the 2009-10 campaign on loan to Plymouth Argyle where he was a regular in the line-up, producing some fine stops. An injury to Schwarzer provided him with opportunities for Fulham at the start of 2010-11 and he also stepped in to the line-up in January when his rival was absent on international duties. David began his career as a youngster with York City, making his senior debut whilst still on scholarship forms, and then played for Darlington before joining the Whites. In the summer of 2011 he joined Ipswich Town in a 12-month loan deal.